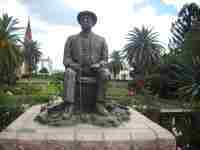 A holiday in Windhoek is flavoured with traditional brews, as well as sausage and sauerkraut, to complement its lovely colonial architecture. You will also find a great mix of colourful African culture that will leave you in no doubt that you are in the commercial heart of a vast southern African country. Namibia's main point of entry by air, most of those who travel to Windhoek come to use it as a jumping off point for a safari trip or desert expedition, spending a few days getting to know the city at the beginning or end of their journey. 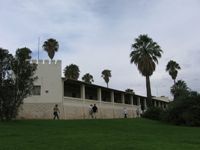 Tourist attractions in Windhoek include the imposing Lutheran Christuskirche, an interesting architectural hybrid, while the Alte Feste, translated to 'Old Fortress', was once the German military headquarters that now operates as a state museum. There's also the Owela Museum, which showcases the country's diverse ethnography, and the National Botanic Gardens, which are great for a stroll and a picnic. The city is well-situated to act as a springboard to many desert attractions nearby. The sun shines nearly every day of the year, and the weather is always warm to mild, even in midwinter, so there is no best time weather-wise to travel to Windhoek. However, summers may be too hot for some, so a preferable period to holiday in Windhoek is either side of the hottest months, between April and June or March and October.